This is an illustration done for Medieval Warfare Magazine, a dutch publication. It depicts a battle between the lightly armed but battle-hardened Almogavars of the infamous Catalan Company and the French Knights of the Duchy of Athens. Guess who won. Heraldry was so beautiful, much better than modern camouflage. Tasteful depiction covering ordinary men on the battlefield. Yet, I believe this time, the two-handed pike or infantry pole-arm formation is coming into fruition with missile weapons such as the crossbow. Beware of gunpowder from China. i like scenes like in the bottom right. Hello Daniel, I have sent you a note, I hope to hear from you soon. As soon as I get off of Mount and Blade, this is what I see XD Omg. This is very detailed. Dont hear much bout this though. niCe to see a art piece of this. So this is medieval Greece? You rarely hear people talking about medieval Greece. Instead people just tend to focus on the classical period instead which is a shame. Awesome work. I was under the impression that the Byzantine Empire did count as medieval Greece though. Man i like it, especialy the knight in the lower left corner. I am using it as my profile picture, almost at all my profiles, but under every picture, there is a link to your deviantART profile. So i hope you will not unleash your rage to me. Btw, I am sorry for my barbarian english. all of your works are quality..I am glad I came across them..
great one! specially for the screaming soldier! very impressive!! I was just wondering would it be okay if i could use this image as concept art please? its from a game design document im doing for uni, the theme is based on medieval times and will have 3d battles, this art piece would come in really handy in describing the looks we are going for. All of this happened after the Fourth Crusade, during which the crusaders conquered most of the Bizantine empire. The Almogavars were famed mercenaries. Infantry famous for their skill at throwing things with lethal accuracy. Oh, Catalan infantry :3 thanks for drawing soldiers of my country. Excellent work, please give some more in Roman/Byzantine area armies/soldiers battles. Good work! The bright colors of the French knights stand out against the earth tones of the background and the Almogavars. The converging lines of the spears and the angles of the warriors also create movement that leads the eye to the knights. The knight falling off his horse in the background gives a hint of what is about to happen and the ultimate outcome of the battle. this is a terrific piece of historical art! Great work. I especially love the action in the art. For instance how part of the battle is spelled out. Something like: Optimistic knights get wounded by javelins, pulled from their tired mounts and killed. Well done! Walter of Brienne was the negative stereotype of a medieval chivalric commander, vain and arrogant. Can you imagine his thought process? "No, you heard me correctly the first time; charge straight ahead INTO the marsh. What's the worst that could happen?" The perspetives, the many people and the whole scenery and compostition are breathtaking! KUDOS!KUDOS! How long did you draw on that? This is just incredible, I take my hat off! I've hear some say that the Battle of Halymyros is where chivalry died. At least for the French Knights it seemed that way. Good detail on the armor and equipment! Awesome!!! How long did it take for u to complete this? It looks like the wily Almogavars are winning! 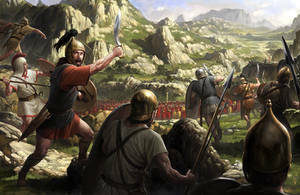 And adds to the argument that 3rd century BC to 3rd century AD Roman soldiers could win against European knights in a straight fight, perhaps easily with the more experienced legionaries and auxiliaries (and even 15th century knights in cutting edge full plate suits would be concerned about tons of Roman era slingers). Absolutely fantastic. Been looking for inspirations for a battle scene in my latest story - and I absolutely found it. I'd love to have paintings like these in my stories. Fantastic!I just also saw your depiction of hussite wars battle and as I am Czech I found it pretty realistic and really well done. Good dynamics, excellent anatomy ang great painting. Simply awesome! I think it rocks from Athens to the Moon. Really, you did a great job recreating the Catalan Company and its different parts: the common officers, the noble officers, the tactics.